Shares of the department store chain popped on bullish words from a key investor and a short squeeze. Shares of Sears Holding Corp (NASDAQOTH:SHLDQ) battled back last month on a bullish endorsement by board member Bruce Berkowitz and a possible short squeeze. According to data from S&P Global Market Intelligence, the stock finished up 20%. As the chart below shows, Sears' gain came entirely in the last week of the month as Berkowitz pumped the stock and shorts appeared to rush in to cover their bets. For most of the month, shares of the ailing retailer continued to sag. Management said it would shutter another 20 locations, bringing this year's total to 265, and Sears Canada declared bankruptcy, a foreboding sign for its former parent. 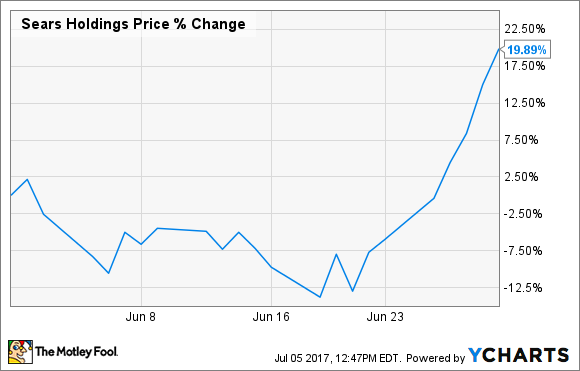 However, Sears stock began climbing on June 22 and gained for eight sessions in a row. The hobbled stock has long been volatile as speculators have poured in to take advantage of the short-term swings, but the surge in late June came as Berkowitz said he valued the company's real estate at $90 to $100 a share. Berkowitz, founder of the Fairholme Fund and a director at Sears, counts the retailer as one of his biggest holdings. His defense of the retailer seemed to spark a short squeeze as the stock was trading near 52-week lows before his endorsement. Short-sellers closing out their bets seemed to have pushed the stock up nearly 50% over eight sessions. Sears' fundamentals remain atrocious as the company has posted an operating loss every year since 2010, often losing $1 billion or more. Comparable sales continue to plummet, and the retail business appears to be in inexorable decline. Berkowitz's argument for the stock as a real-estate play doesn't really make sense considering the company has already spun off a number of stores into Seritage Growth Properties, and the underlying real estate value doesn't compensate for operating losses. The stock was headed down as of this writing on July 5. It looks like the June rally has come to an end. If I was a shareholder, I'd take the opportunity to exit.